January | 2012 | Wiffle Lever To Full! Happy New Year, everyone! I’ve never been much of a one for making resolutions, but I’m hoping to post on here a bit more regularly during 2012. Especially as I’ve spent much of the Christmas period ‘sorting out’ in the loft (translation: pointlessly moving piles of stuff from one cardboard box to another) and have a whole host of little nostalgic nuggets that I’m absolutely itching to share. Still, that’s fibre-glass loft insulation for you. You might assume that this comes from some long-forgotten dark corner of the sexist Seventies, but – brace yourself – the dates mentioned at the bottom of the flyer are undoubtedly from 1990. I distinctly remember this little missive doing the rounds in our Sixth Form common room during that particular year, brought in by louche rockabilly obsessive Simon Lee, who once told me that his three favourite TV programmes of all time were (in order) The Sweeney, The Dukes of Hazzard and Juliet Bravo. 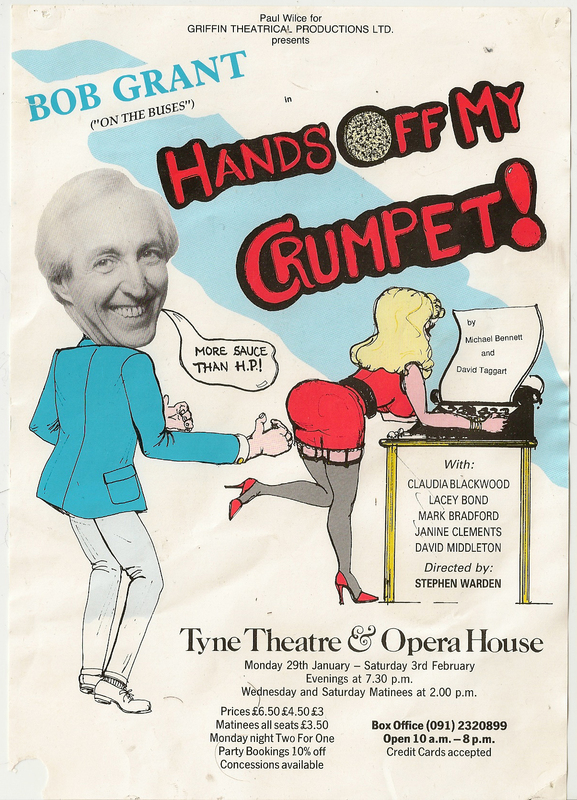 I have a bit of a soft spot for traditional theatre farces, and once met Windsor Davies and Robin Askwith in the car park of Billingham Forum after a performance of Doctor In The House, but sadly I didn’t make the pilgrimage to the Tyne Theatre & Opera House to see Hands Off My Crumpet, which is a shame as I’d have liked to have seen the late, great Bob Grant in action. If nothing else, it would have been nice to see if the trousers on the flyer were an accurate representation of the ones he actually wore onstage, and really DID have the colour washed out of them from the calves downward. Anyway, let’s all have fun debating whether the item of food incorporated logo IS actually a crumpet, because in my house during the 1970s and 80s, that would definitely have been called a pikelet. What’s ‘Wiffle Lever To Full’? Wiffle Lever To Full – The Movie! Wiffle Lever To Full! Now Available as an E-Book!